1.Firstly Clean The Roof: make the roof clean by cleaning cloth with alcohol, fresh water also available without alcohol, be careful for avoiding scratching the lacquer on surface. 2. Find out Installed Position: Place two roof racks on the automotive roof and adjust the radian to get the best position. Draw a mark with pencil when you confirm the position. 3. Wipe Adhesive glue: Wipe adhesive glue on the marked position with clean facial tissue. 4. Make preparation for Installation: Rive the red paper above 3M adhesive glue. CAUTION: don't touch the surface of 3M adhesive tape. 5.Installation: This is the critical step, it must need at least two persons, one person catches one terminal of roof rack respectively, aim the marked position, meanwhile, press the roof rack with big pressure (notice: don't move hands until 20 seconds later).It will succeed after 20 seconds. Remark: suggest don't wash the car within 3 days. 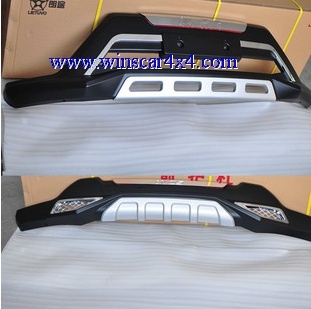 We mainly manufacture and export : Grille / Rear Guard ,Rear Spoiler ,Door Visor ,Running Board ,Bug Guard ,Chromed Accessories Kit ,Wooden Dashboard Kit ,OEM / Universal Fog Light ,Led Car Logo Light ,Roof Rack ,Spare Tire Cover ,Front Grille ,Airbag Cover .